Shutter Island is one of those rare films that needs to be seen twice to enjoy the nuances within the performances fully. However, as great as those performances are the movie suffers from a lack of pace and some clunky scene changes.... but lets start with the good stuff. It looks gorgeous, the BluRay bringing Scorsese's film to life in all its glory and throughout the direction is superb. There's an almost old school feel to it and one wonders whether this is a dying breed of film maker, who's skills and technical ability go so far beyond those that are coming up behind him. The story, based on Dennis Lehane's book, details the arrival of two US Marshalls on Shutter Island , a psychiatric institution for the criminally insane. It's 1954 and one of the patients has escaped from their cell and it's the Marshall's job to find her. 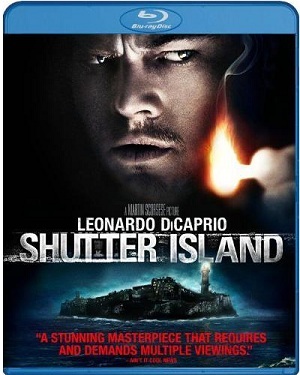 Teddy has been trying to find an excuse to visit Shutter Island for a while, his wife's killer is incarcerated there and he's on a personal mission to find and kill him. A fierce storm traps him and his partner on the Island and they quickly start to realise that things are not as they seem, suspecting that the doctors are conducting experiments on the patients. There are great supporting performances from Ben Kingsley and Max Von Sydow as the two lead Doctors, but again the subtleties of both are lost on first viewing, where there's just a weird feel to both characters that you can't put your finger on. It's another twist movie, sort of, although the twist is a pretty obvious one and there's almost a, 'Oh, I wish they hadn't done that moment,' towards the end (although the last scene helps to alleviate some of that feeling). Shutter Island feels less than the sum of it's parts, it's like a great looking game where the gameplay isn't up to scratch. You enjoy looking at it but the story doesn't feel coherent and would almost work better if the twist was revealed in the first five minutes letting the journey of the lead could play out more naturally. It's cool that it works so well second time around but surely it should on first viewing too? The images of Dachau are effective and disturbing, although at times the jump between what's a dream or a memory is not clear. The scenes with Teddy's wife are full of poignancy with a gathering intensity once Teddy becomes convinced he's been drugged by the Doctors, who are determined to keep him on the Island fearing he might reveal their dark secrets. Shutter Island has a great movie within it fighting to get out but, sadly, it falls some way short although it's still an enjoyable enough film that actually improves on second viewing. Rent it and watch it twice.